감사합니다! 제 이름은 리사입니다. 저는 오스트리아인으로, 아일랜드 더블린에 있는 트리니티 칼리지에서 국제평화학을 전공하는 석사 과정 학생입니다. 지난 3개월간 저는 서울에 있었습니다. 제가 다니는 학교의 김동진 교수님이 우리민족서로돕기운동의 정책위원이신데요, 교수님과 우리민족서로돕기운동의 강한 유대감과 친밀함을 통해 학생들은 인도주의 분야에서 평화 구축에 대한 실질적인 경험을 쌓을 수 있게 되었습니다. 저는 한국 문화를 탐구하고 남북 내 갈등을 더 잘 이해하고 싶은 열망으로 인턴쉽을 시작했습니다. 인턴 시작 전에 학교에서 한국어 강좌를 수강하고, 대북지원 잠재력과 한반도 평화 증진과 관련된 에세이도 썼습니다. 당초 저는 인도주의 지원 분야에서 일하려는 생각은 없었습니다. 단순한 흥미 부족이 아니라, 의약품 분배 및 특히 분쟁 지역에서의 농업 및 평화 교육 프로젝트 수립을 포함한 일들이 외부인들에게는 매우 추상적이기 때문입니다. 우리민족서로돕기운동에서 일하면서 특히 매년 개최하는 대북지원 국제회의를 준비하면서 비로소 이 작업이 얼마나 중요하고 동시에 얼마나 복잡한지 이해할 수 있었습니다. 솔직히 향후 몇 개월 이내에 한반도에서 어떤 일이 벌어질 지 저는 잘 모릅니다. 다만 제가 이번에 깨달은 것 중의 하나는 남북한의 정치적 통일이 남북 간의 사회적 평화 프로세스를 시작한다는 것과는 다르다는 점입니다. 통일을 하든 하지 않든, 우리가 일하고 노력하는 것은 평화를 위해서입니다. 김동진 교수님과 우리를 가족처럼 따뜻하게 맞이해준 우리민족서로돕기운동, 아이리시 스쿨 오브 에큐메닉스(Irish School of Ecumenics)에 감사드립니다. 그리고 특별히 나의 친구 로라에게도 감사를 표하고 싶습니다. 제가 얼마나 그녀가 가진 포부와 친절한 태도, 사람들을 향한 뛰어난 공감 능력에 고마워하는지, 로라는 잘 모를 겁니다. 우리가 함께 이렇게 풍부한 경험을 나눌 수 있어서 매우 감사합니다. 저는 기본적으로 그 지역의 언어를 배우는 것이 그 지역 사람에 대한 존중심을 나타내는 가장 빠른 길이라고 믿습니다. 제가 단어의 힘을 알고 있다 할지라도, 한국어로 저의 의견과 감정을 온전히 다 표현 못하기 때문에 누군가를 존경심으로 대할 때 말은 부수적인 것으로 여겨집니다. 오래된 격언이 있습니다. “사람과 사람을 가장 가깝게 이어주는 건 웃음이다”. 이것이야말로 진실을 증명해주고 앞으로 평화를 만들기 위해 배운 가장 중요한 교훈 중의 하나일 것입니다. Kam-sa-ham-ni-da! 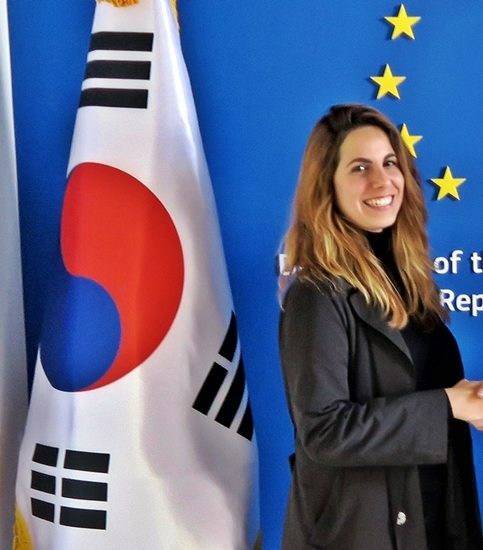 My name is Lisa and as an Austrian master’s student in International Peace Studies at Trinity College Dublin, I was given the opportunity to live in Korea’s capital city, Seoul, for the last three months. Don Jin Kim, our Korean professor at Trinity, is the policy advisor for the Korean Sharing Movement (KSM). Through his strong bond and friendship with the team of KSM, he enables students to gain practical experience in peacebuilding within the humanitarian sector. I was driven to undertake this internship due to my desire to explore Korean culture and better understand the Korean conflict. To prepare for my move, I took a Korean language course at Trinity and wrote an essay about the potential of aid to North Korea and its effectiveness for the promotion of peace on the Korean peninsula. In all honesty, I did not intend to work in the area of humanitarian aid. This is not rooted in a lack of interest, but rather because these operations - including the distribution of medicine and setting up agricultural and peace education projects, especially in conflict zones - are quite abstract for outsiders. Only by being part of KSM and involved in the organization of their annual conference on humanitarian and development assistance to the DPRK, could I truly understand how immensely important this work is and, simultaneously, how complex these processes are in practice. It remains an open question as to what will happen on the Korean peninsula in the next months, but one of my biggest realizations was that the political reunification of the two Koreas is different than the initiation of societal peace between the North and South Koreans as a family. With or without reunification, above all, it is peace we are working and striving for. I would like to thank the Irish School of Ecumenics, our brilliant professor Don Jin Kim, and especially the wonderful team of KSM for their unwavering support, warmth and for making us feel at home. Special thanks to my friend Laura, who probably does not know how much I appreciate her ambitious and kind attitude as well as her sense of empathy towards people. I am very thankful that we could share this enriching experience together. Overall, I believe learning the language of the country you live in is the easiest way to show respect to the local population. Even though I am aware of the power of words, it was the inability to express my opinions and feelings in Korean that made it evident that when treating someone with respect, words are incidental, if not redundant. Once more, the old saying “a smile is the shortest distance between two hearts” has proven to be true and it has perhaps been one of the most valuable lessons I have learned in order to cultivate peace in future.